Make your own paper lamp MOD with our printable PDF pattern! It’s easy! 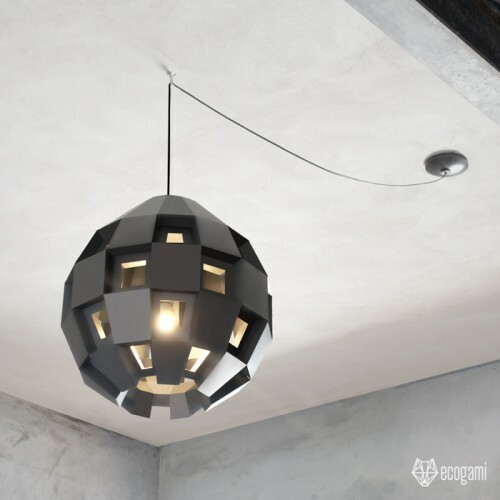 Just follow the instructions & you will be proud of your geometric & minimalist faceted lamp. Isn’t it a nice & unique home decor for your sweet house? Modern & minimalist, you won’t find this lamp anywhere else! This model has a medium difficulty. It isn’t hard technically speaking but it requires a lot of time and patience. Don’t be afraid, I assembled the sculpture, so everybody can do it! Put your music on & enjoy the assemblage! (For me it is a perfect way to relax). ► Once purchased, download the ZIP file with the patterns (PDF files to be printed with A4 or A3 sheets – Letter or Tabloid in the States) & the complete instructions in English to make the sculpture. Choose the A3 or the A4 pattern according to the size of the lamp you want. IMPORTANT: A4 pattern is for a 36 cm diameter lamp / A3 pattern is for a 44 cm diameter lamp. ► Difficulty Level: Medium – This model isn’t hard technically speaking but it requires a lot of time and patience.